Innovative. Compact. Sustainable. Friendly. Swainway Urban Farm is a new model for growing. Settled on a large lot in Clintonville Ohio, Joseph Swainway and partner Jess Billings (of Jess Bee Natural lip balm fame) have a half acre empire dedicated to growing edibles in an earth friendly way. Their farm grew out of a desire to provide themselves with healthy fresh food. As their interest deepened, their garden grew to the point of being able to give and sell the excess to friends and family. Soon, restaurants came calling and Swainway Urban Farm was born. In 2011 the farm applied for and received Organic status by the Ohio Ecological Food and Farm Association. Minimizing garden inputs is one goal of the farm. Joseph maintains several large compost heaps designed to produce rich organic matter to return to the soil. Part of the motivation for growing edible mushrooms was to use the spent mushroom beds in the compost. The enzymes found in the mushroom compost ‘closes the loop’, as these nutrients are unavailable from traditional plant compost. The farm was also founded to be an educational resource for home growers and healthy eaters. Jess and Joseph are eager to share gardening and cooking advice at their Clintonville Farmer’s Market stand. They are participants in the Clintonville Farmer’s Market children’s program where kids visit and help work on the farm. 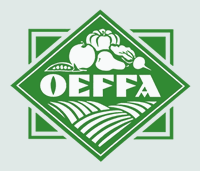 On August 7 from 2-4 pm the farm will be open for an OEFFA Farm Tour. Joseph and Jess gave intern Keara and I a tour in mid-April. The farm was in the midst of seedling production. Heirloom seed starts grew under artificial light and then were transfered to the large greenhouse. They were transplanted into four inch pots for selling at the Clintonville Farmer’s Market and Clintonville Community Market. Joseph and Jess also grow a wide variety of produce for restaurant chefs and farmer’s market shoppers. From early spring through the fall, the farm provides radish, kale, and pea shoots. Shitake mushrooms have been a popular item for years and this spring Joseph debuted oyster mushrooms. Lettuces, herbs, greens, tomatoes, carrots, and more are available seasonally. Keara had this to say about visiting Swainway: “Rachel introduced me to two amazing, hard working farmers, Jess and Joseph. They live in an urban area and yet are still driven to have the most sustainable lifestyle possible. I was in awe of their backyard as they used every inch they could for gardening purposes. For more information, visit Hounds in the Kitchen.